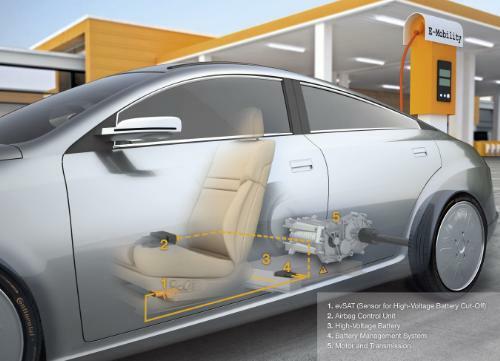 Continental, the international automotive supplier, has developed a sensor (satellite) for electric and plug-in hybrid vehicles which will immediately shut off the high-voltage battery in the event of a collision. This means that emergency service personnel can come to the aid of accident victims without the risk of suffering an electric shock. "The evSAT acceleration sensor is active in charge mode. It detects an accident and passes this information on to the battery management system which then shuts off the high-voltage battery," said Dr. Axel Gesell, Senior Manager Platform Development Sensors & Satellites, in the Passive Safety and ADAS business unit of Continental's Chassis & Safety Division. "The major benefit of our product is that it prevents fire and rescue service personnel sustaining high-voltage injuries when coming into contact with vehicle metal parts or if they have to cut through the vehicle to recover accident victims," Gesell added. Electric vehicles and plug-in hybrids are powered by high-voltage batteries of up to 400 volts. evSAT will go into series production with a major German vehicle manufacturer in 2012. 'evSAT' stands for 'Satellite for Electric Vehicles' and essentially consists of an independent, triaxial sensor with a CAN (controller area network) interface. During the charge phase, the other vehicle electronics, including the airbag system are not operational. So as to avoid the considerable expense of adapting the airbag system to meet new requirements, Continental has developed evSAT for the vehicle's charge mode. The accelerator sensor employs an algorithm to detect a frontal, rear or side collision with another vehicle and immediately transmits a signal via the CAN interface to the battery management system which then switches off the battery within half a second. evSAT reacts in the same way if it detects a rollover in driving mode. In this case, the battery is deactivated within four seconds at most. In the event of other types of driving accident, evSAT remains inactive. In such cases, the airbag system assumes the task of cutting off the battery. If the electric or plug-in hybrid vehicle has been switched off and is not being charged, the evSAT moves to a standby mode to prevent the battery discharging. As such, evSAT represents an additional passive safety system function for electric and plug-in hybrid vehicles. Most high-voltage batteries in electric or plug-in hybrid vehicles generate a voltage of 400 volts, twice as great as the standard domestic plug socket and potentially fatal. Already, in the United States, there is a legal requirement for the vehicle power supply voltage to fall to below 60 volts within five seconds of an accident occurring. "As electromobility continues to develop, the safety of electric vehicles will assume an increasingly important role. The need for technologies to meet future challenges is already demonstrated by the additional demand for evSAT from numerous other vehicle manufacturers," said Telmo Glaser, Continental's evSAT project manager. Essentially, evSAT can be installed in a number of different places in the vehicle; it should, however, be placed sufficiently well inside the vehicle (beneath the front passenger seat, for example) to avoid being damaged in an accident. The advantages of using evSAT are that there is no need for the conventionally powered vehicle variants within a model series to be modified. evSAT can be integrated into the existing systems of electrically powered vehicle variants without redesign work. This benefit also increases flexibility as regards installation space, customer-specific requirements and development time. Savings can be made due to lower system development costs and by avoiding placing greater demands on the airbag system. The sensors will be produced, starting this year, in Continental's Regensburg, Germany plant.